I grew up in a typical middle-class home. Although the world of the wealthy was appealing to me, what interested me more was the world of the poor. "Why?” was the primary question I grappled with over the years. I was simply unable to fathom why the poor could (or would) not lift themselves out of poverty. I believed that if "those people” simply tried harder or had "better values,” they would be able to succeed. Today, I realize that this attitude was terribly small-minded and prejudiced. But I had to discover that on my own. Extensive education and travel opened my eyes and transformed my soul. Today, I know much more about what goes on in economically disadvantaged families. This evolution in my thinking is not what drove me to write this book. Instead, I was inspired by this stunningly simple question: "If life experiences can change poor kids for the worse, can't life experiences also change them for the better?” Seeing and hearing how kids from desperate home circumstances succeeded in schools around the world intrigued me. More than two decades ago, I cofounded an academic enrichment program called SuperCamp that has changed tens of thousands of lives worldwide, so I know change can and does happen. My own success and that of others inspired me to find out how it happens—and how it can be replicated. Chronic exposure to poverty causes the brain to physically change in a detrimental manner. Because the brain is designed to adapt from experience, it can also change for the better. In other words, poor children can experience emotional, social, and academic success. Although many factors affect academic success, certain key ones are especially effective in turning around students raised in poverty. In this book, I discuss these key factors, highlight real schools that possess these factors, and provide a template for success with specific research-based action steps. If a strategy makes the difference between learning and not learning, it's crucial. Here, I share such knockout factors as well as the research behind them. About that research. Researchers often claim, "This is what works.” But for whom? Low-income, middle-income, or upper-income kids? Was the study conducted over a few weeks, or did the researchers record longitudinal data for 10 years after graduation? What does the phrase highly effective teachers mean? Did these teachers' students earn high scores on standardized tests? Or did they enjoy overall success in life? Is the recommended strategy sufficient in itself for success? Is it necessary for success? If so, is it necessary for all students? Too many sources fail to elucidate these factors and boil down the research to clear strategies that busy educators can apply directly in their practice. That's a gap that this book aims to fill. Here, I focus on the few things that matter most; take any one of these factors out, and you're likely to fail. Why is there such a stark disparity in academic achievement between low-SES and well-off students? Theories explaining why economically disadvantaged students underperform in school abound: their parents do not have high IQs, their home environment is substandard, their parents are missing or have moved, or they just don't care. Yet these assumptions just perpetuate the problem. A proportion of kids raised in poverty do succeed, so we know that a high income level is not a necessary and sufficient condition for academic success. It's true that many poor students have not succeeded, but that's due less to parents than to certain school-site variables that may surprise you. This book offers a three-pronged approach. 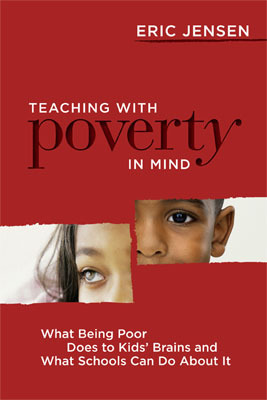 First, it provides a better understanding of what poverty is and how it affects the students you work with. You'll learn more about the social, cognitive, health-related, and stress-related challenges that economically disadvantaged kids face every day. Second, it demonstrates what actually drives change, both at the macro level (within a school) and at the micro level (inside a student's brain). You'll learn about turnaround schools as well as schools that have a history of high performance among students raised in poverty. The better you understand how to bring about change, the better you can engage the resources necessary to make it happen. Finally, this book addresses you and your school. What can you learn from those who have succeeded? What practices are replicable? Which instructional strategies will help you make miracles happen? In this book, I aim to provide more than a framework. I give you the theory, the research, and the strategies to ensure success at your school. What I do not aim to provide is an exhaustive compendium of every idea on reform, every instructional strategy, and every consultant's opinion on cultural differences. This book assumes you already know that leadership counts, that a healthy environment is crucial, that you should use effective pedagogy, that school safety is number one, and so on. Here you'll learn about what will give you an edge. Think of this book as a spotlight focusing attention on what matters most. I hope that the strategies offered in this book, distilled from my own experience and research, will provide an inspiring and practical guide for improving the lives of your own students.